Woolly is the greatest sheep who ever lived. 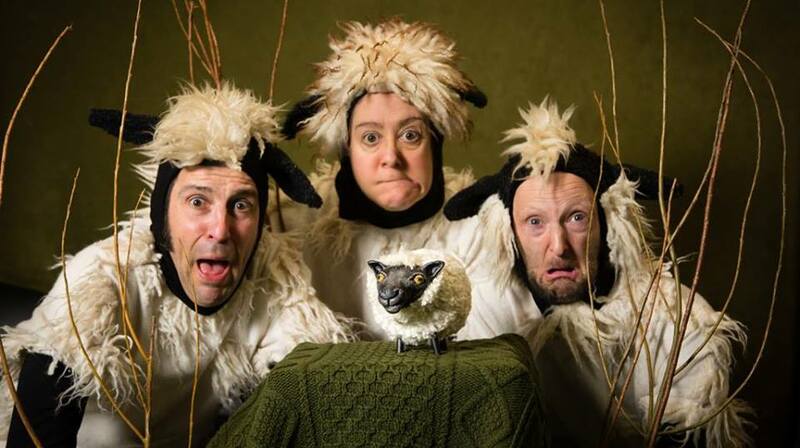 This is told to us gleefully, frightfully and musically by our three sheep chorus: performers Helen Gregg, Jonathan Gunning and Miquel Barcelo. Woolly’s Quest is a devised piece with a classic hero’s journey narrative, through fields and dark forests, as Woolly goes in search of her lost fleece, taken from her on the dreaded sheering day. This play has so much to offer across the board in terms of production values and being just plain fun, but Gregg, Gunning and Barcelo’s abilities are the most overwhelmingly lovely, hilarious and fine-tuned aspects of the experience. They move with an incredibly sheep-like gait and cartoonishly expressive faces, telling the storybook-like tale through English and Irish, without alienating non-bilingual audiences or young children at the beginning of their Irish education. The musical score and songs are performed entirely on stage, mostly by Barcelo, on an array of odd and charming instruments (washboard, hurley-violin, clarinet, you name it). I couldn’t keep track of how many different instruments he could play at once, with an almost cinematic perfection to the tone-setting melodies. He is joined in song by his fellows, and Gregg’s singing voice is beautiful and clear and (I’ll have to keep track of how often I use this word) fun. Gunning’s slapstick physicality never wavers as he and the others weave in and out, puppeteering and reacting and switching languages – this is not an easy performance. There is always something to look at or listen to during the 45 minute piece: your attention is kept and encouraged throughout. That the production was devised is a possible cause of the minor lag in the story’s middle where it feels as though Woolly spends too long meandering and being scared without meeting new characters or having new problems arise. However, and I must be emphatic here, I am a grown up and this is an adult’s perspective on an experience intended for children. The pacing of the story is first and foremost for the children, as is everything about the show’s design, even though it shines in the details where adult oriented productions often fail. This company knows how to cater to their true audience, even if the feedback and reviewing and word-of-mouth recommendation is controlled by an adult audience. It is perhaps too common that children’s shows are deemed successful when they are enjoyed equally by adults and children. I cannot deny the excitement, laughter and gasps from the 200 hundred or so primary school kids who shared the auditorium with me. The children were clapping along happily to any small perceived rhythm in the music, eager and excited to respond to the antics on stage. Although the kids seemed to want to be asked for help a little more, it is possible that encouraging any further participation from 400 five-year-olds may have devolved the piece into chaos. Not every children’s show must be like a pantomime, but it is important not to stifle the energy in the audience. They struck a fair balance here in keeping the control with the performers but allowing the laughs and the music to thrive.